120 Thursday October 28th 1875. A very pleasant day. Mother went to the valley We girls got on nicely with the work. Did a big ironing in the forenoon. Win was over a few moments in the afternoon. I walked to town and made a call at Mygatts. I had churning to do at night and was all the evening getting the work done for Hattie spent the evening over to Wins. Friday October 29th 1875. A gloomy day. I did the work and let Hattie sew some. Mother got home just before night. It was a bad night but we girls went over to Mygatts as Rob went to society. and he came to bring us home. It was a horrible night I dont think I was ever out a worse one. We had a real pleasant time while there. 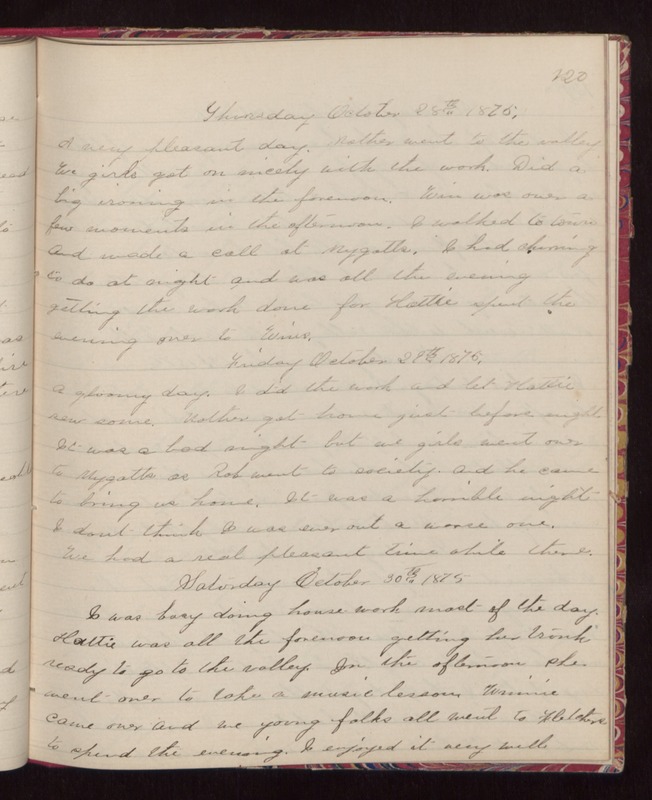 Saturday October 30th 1875 I was busy doing house-work most of the day. Hattie was all the forenoon getting her trunk ready to go to the valley. In the afternoon she went over to take a music lesson. Winnie came over and we young folks all went to Fletchers to spend the evening. I enjoyed it very well.